When you exclude rounding, the decline in year over year core inflation was steeper. In September it was 1.93725% and it October it was 1.77744%. That’s closer to a two tenth decline than one tenth. The big year over year challenge will be in March 2019. Year over year core inflation went from 1.66% to 1.96% in March 2018. If the Fed stays with its current dot plot, the yield curve will invert soon. The Fed can prolong the expansion, if it lowers its expectations for 2019 hikes from 3 to 2 or 1. If the Fed lowers its guidance for rate hikes, I wouldn’t be surprised if the futures market starts forecasting 0 hikes next year. Even though energy isn’t part of core inflation, the two are correlated as the chart below shows. That’s likely because both are cyclical. Whenever oil prices fall, bullish stock investors are quick to blame supply. However, weakening global growth has explained the last two major crashes. The crash in 2014 forebode the economic weakness in 2015 and 2016. It also caused weakness in countries which export the commodity. I’m not denying the impact supply has on prices. I’m simply recognizing oil’s great track record. 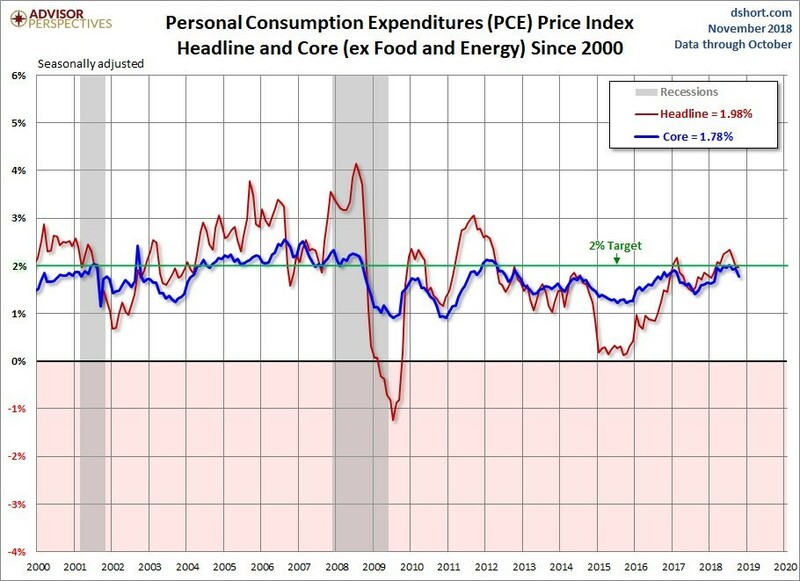 As the chart below and above show, core inflation has fallen in times of economic weakness and risen in times of accelerated growth. Core inflation is made up of cyclical and acylical factors which muddies the picture. 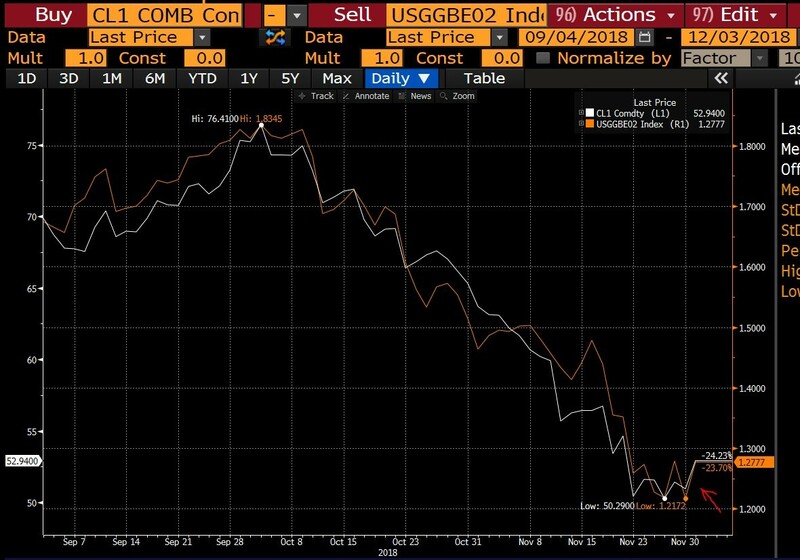 As you can see from the chart below, oil and 2 year breakeven inflation have been highly correlated since early September. It’s fair to say oil is driving breakeven inflation lower. However, it’s not as if the overall economy has been accelerating and stocks have been powering higher in this period. I think oil is an important factor which is causing breakeven inflation to fall, but it’s not the only one. The high correlation with oil shouldn’t imply that nothing else matters to breakeven inflation. Because some analysts view oil as the only factor, they are starting to question the veracity of breakeven inflation. 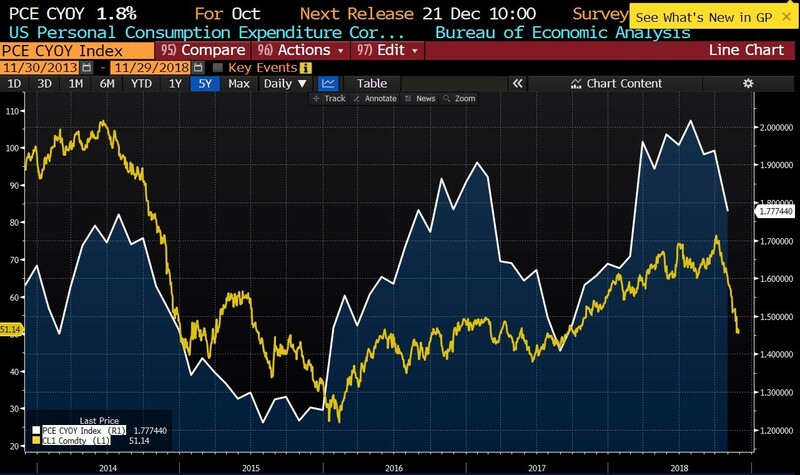 I still trust the breakeven inflation rate as other commodity prices are falling and global economic growth is slowing. There will be lower inflation in 2019. Oil has been correlated with core PCE and core PCE doesn’t even include energy prices. The chart below shows what each portion of core PCE needs for it to be up 2% year over year. As you can see, housing services has seen a minor decline in its contribution, but it’s still running above the rate needed for 2% core PCE. Core goods excluding pharmaceuticals hurt core PCE growth, but is above its target for 2% core PCE. 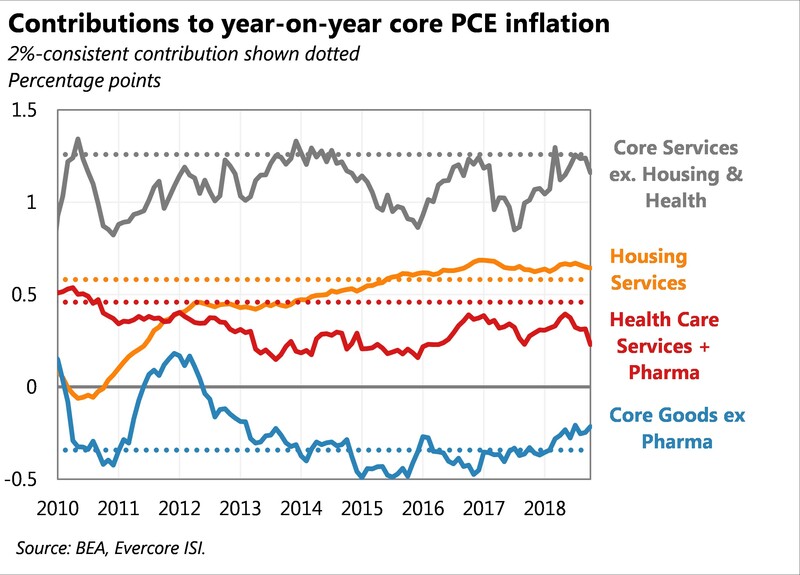 On the other side, both healthcare services plus pharmaceuticals and core services excluding healthcare and housing are running below their target for 2% core PCE. This explains why it was only 1.8% in October. Soon housing services will join them below its target which will push core PCE growth closer to 1% than 2%. This was a great report for the consumer because inflation missed estimates while income and spending growth beat them. Real wage growth will be very strong in the last couple months of the year. This was due to weak inflation and accelerating nominal wage growth. Wage growth hasn’t driven inflation which has allowed for the possibility of strong real wage growth. On a month over month basis, personal income growth was up 0.5% which beat estimates for 0.4% growth and the prior reading of 0.2% growth. Consumer spending growth was 0.6% month over month which beat estimates for 0.4% growth. This beat makes sense as the September report was revised to show 0.2% growth instead of 0.4% growth. 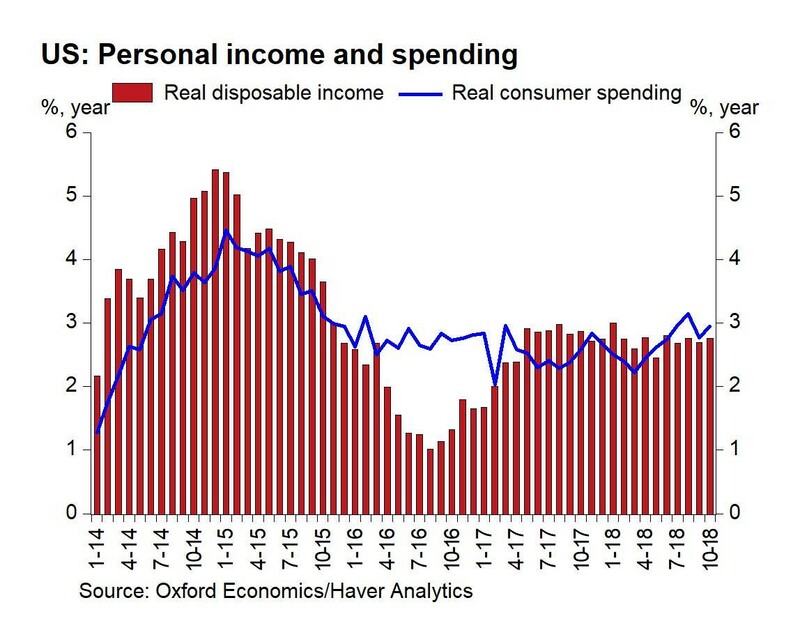 As the chart below shows, both real consumer spending and real disposable income growth have recovered from their 2016 lows, but neither have reached their peak in early 2015. Spending growth is faster than income growth which implies the savings rate is falling. It’s not as bad as 2016 when spending growth was almost 2% higher than income growth. The Fed can lower its guidance for 2019 rate hikes in December and eventually pause rate hikes to extend this expansion as core inflation is starting to fall. If the Fed doesn’t change its guidance, the yield curve will invert which implies a recession in 2020 is probable.